Memory cards are the digital film that stores all the shots you take until you move the image files to a computer. The cards come in different shapes and sizes, and they are critical for capturing all your photos. It is important not to skimp when it comes to selecting your memory cards. 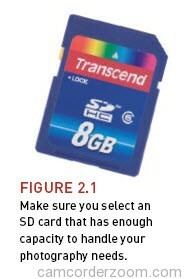 The G12 uses Secure Digital (SD) memory cards (Figure 2.1). Size matters, at least in memory cards. At 10 megapixels, the camera requires a lot of storage space, especially if you shoot in the RAW or RAW + JPEG mode (more on this later in the chapter) or shoot video. You should definitely consider using a card with a storage capacity of at least 4 GB. Consider buying high-capacity SDHC or SDXC cards. These cards are generally much faster, both when writing images to the card as well as when transferring them to your computer. If you are planning on using the Continuous shooting mode for capturing fast action, you can gain a boost in performance just by using an SDHC card with a Class rating of at least 4 or 6. The higher the class rating, the faster the write speed. Having a fast card also benefits your video capture by keeping the flow of video frames moving quickly to your card. Buy more than one card. If you have already purchased a memory card, consider getting another. Nothing is worse than almost filling your card and then having to either erase shots or choose a lower-quality image format so that you can keep on shooting. With the cost of memory cards what it is, keeping a spare (or two) just makes good sense. Low key photography and How to isolate your subject.